My abiding memory of going to see The King’s Speech at the cinema was the bizarre round of applause that came at the end from about two thirds of the Hammersmith Cineworld audience, a truly odd moment. I did rather like the film, but couldn’t quite see why it was lauded quite so much: it tells its story extremely well but lacked a certain emotional heart for me, I didn’t end up caring a huge amount for Colin Firth’s George VI if I’m honest. 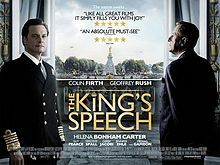 But as the film came on over Christmas, I decided to give it a go again, not least becaus I will be going to see the play of The King’s Speech in Guildford in February, David Seidler having initially written this for the stage. Again, I did quite enjoy watching the film, but was struck by how emotionally uninvolving it is for large stretches. Normally, I’d be a sucker for this kind of thing but for whatever reason, it never quite hits the mark. Firth is good as the monarch faced with trying to conquer his stammer but his Oscar should really have come the year before for A Single Man and Geoffrey Rush is superb as the anarchic Antipodean speech therapist whose unconventional methods eventually reap rewards. But it is only in Helena Bonham Carter’s excellent Queen Elizabeth (now, she should definitely have won the Oscar for making such a brilliant job out of a role that basically required her to just react) that the movie has any heart, her looks of tender concern and joy full of deep meaning and a wry sense of humour about her position that manifests itself in some great one-liners. Tom Hooper’s direction conveys a strong sense of claustrophobia, with indoor shots aplenty in the plush locations and contrasted nicely by the openness of Rush’s Logue – both in his studio where a range of amusing (if overplayed) coping techniques are explored to conquer the speech impediment; and in the physical language that Rush displays with consummate artistry. He really is like a conductor, leading his instrument to deliver the performance of a lifetime, as evidenced in the final speech delivered to the nation on the outbreak of the Second World War, topped off by a beautiful smile from Claire Bloom’s Queen Mother. The ever-developing nature of medicine and diagnostics, and the relationship between King and medical expert ends up reminding a lot of Alan Bennett’s play The Madness of George III – there’s even a little cheeky referencing of his ancestor by Firth’s King – and so it will be interesting to see how it translates onto the stage. Theatrical spots in here include a brilliant opening sequence featuring Adrian Scarborough as a radio announcer, that new-fangled invention causing all the fuss in pushing the Royals into hitherto unknown levels of exposure, and Eve Best as Wallis Simpson. This was actually the first time I’d seen Best and so she passed me by a little as it is a small role, but after seeing Much Ado About Nothing at the Globe and falling utterly in love with her, it was really nice to go back and see her in this (even if I ended up being a little Team Wallis by the end). Derek Jacobi and Michael Gambon offer sterling support as does Anthony Andrews, but I wasn’t too keen on Timothy Spall’s Churchill – in a role that revises history a little – but that says more about how I feel about Churchill I suspect. My other strong feeling by the end was that I long for the day that Jennifer Ehle might make a return to the theatre so that I might get to see her on the stage.